The flag of Colorado contains three equal-sized horizontal-stripes, with the top and bottom stripes being blue and the middle stripe being white. On top of the stripes a Circular red C is overlaid, filled with a golden disc. 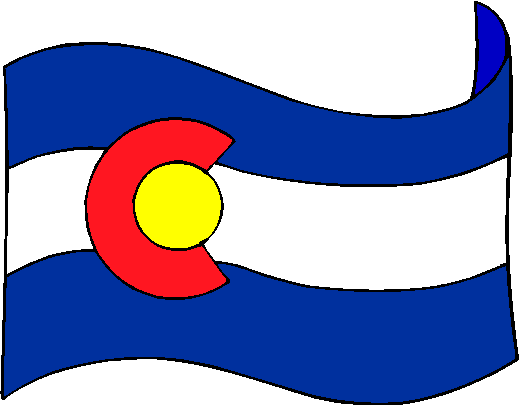 Colorado's flag was designed by Andrew Carlisle Johnson in 1911 and adopted by the state's General Assembly on June 5th of that same year. The original legislation did not however specify the exact shades of blue or red, or the size of the C, which led to some variations in the flag. Subsequent legislation in 1929 and 1964, respectively specified that the blue and red short be the same colors as on the flag of the United States, and that the diameter of the gold disc should equal that of the center stripe. The Pillow Covers Made of 50% Cotton and 50% Linen,Comfortable & Warm Touch. Print on double side.The front pattern the same as the back.brings novelty Look To Your Home Decor.Brings Fantasy Look To Your Home Decor,Living Rooms, Bedrooms, Offices, Kitchen,Car etc. Quality:Our Pillow Case made of 50% cotton and 50% linen natural material,no peculiar smell,it will decorate your house,it is luxury ,breathable,durable and stylish. Our Guarantee:Money-Back Guarantee,Replacement Guarantee.or Free. We very much appreciate you shopping pillow cover on our store! 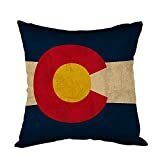 Artist rendering of Colorado flag: Spin this ornament 360 degrees to view the weathered flag that includes the classic red C on a blue and white background. Hand Blown Glass Sphere: Skilled artisans individually inflate each ornament ball from molten glass. No two are exactly the same, each measures approximately 3" in diameter. Gift Boxed: The perfect keepsake for any Colorado lover or as a memento of that special, once-in-a-lifetime trip. Arrives in a padded square felt gift box that's useful for gift giving and safe storage. Colorado flag like you've never seen it before. 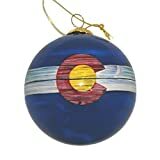 This beautiful, reverse-painted glass ornament shows the distressed style Colorado flag in full 360 degrees. It continues an ancient art-form prized by collectors. The artists choosing from a selection of miniature curved and bent-shafted brushes, painstakingly hand paints every minute detail on the inside of the ornament. The craft requires the artists to repeatedly insert the brush through the small opening in the sphere; first to outline the design, and then to detail the colors one by one. The entire process for each ornament requires up to two days. No two pieces are identical, making this inside-painted glass ornament a keepsake to be treasured from generation to generation.